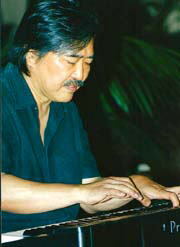 Shiro is currently working as a Jazz Pianist/Guitarist in Japan. CD "Rendezvous at Eight" released by Jimmy C.
All arrangements done by Shiro. Live with the BB'70s band at "Whisper." BB'70s Live at "Tokyo Club." BB'70s Live at "Sometime" in Tokyo. BB'70s released their first album. musicians at Mulligun's in Wailea. a jazz club in Ginza,Tokyo. BB'70s live at TOKYO CLUB in Hogou, Tokyo. which he had worked since 1992. Marv Blue, a famous Saxophone player. at the Coffee Company in Wailuku.